The Puyallup Tribe of Indians is building a library of genetic material from coho salmon to better understand the different populations throughout the Puyallup River watershed. 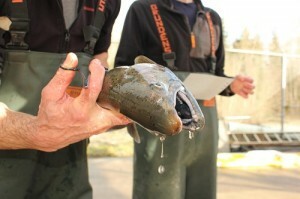 A winter coho is sampled for genetic material on the White River, a tributary of the Puyallup. Winter run coho migrate through the Puyallup as late as February or even March while the earliest run fish are often seen as soon as July. “There isn’t much time when coho aren’t moving into the freshwater to spawn,” Ladley said. “Thirty years ago the state Department of Fish and Wildlife sprinkle planted coho fry throughout the watershed, so I would like to find out if the fish are all the same or are still diverse,” he said. Much of the Puyallup coho’s historic habitat has been degraded in the past century and is still disappearing, making an analysis of interrelationships vital. Coho salmon spend an extra year in freshwater as juveniles compared to other salmon species, making them more vulnerable to declines in freshwater habitat. Low flows reduce the amount of habitat available for coho rearing and can cut fish off completely from valuable habitat. “When it comes down to it, fish need water to survive,” Ladley said. “This genetic data will give us a clearer picture of exactly how diverse they are, and hopefully give us information we can use to better manage the stock,” he said. With the influx of chum salmon last fall, the Port Gamble S’Klallam Tribe was able to take twice as many eggs as usual, up to 1.2 million. In anticipation of the large run, natural resources director Paul McCollum brought in an idea from his time in fisheries in Alaska – a NOPAD incubator, a tower of six 4′ x 4′ x 15” aluminum trays that can accommodate up to 1.5 million eggs. 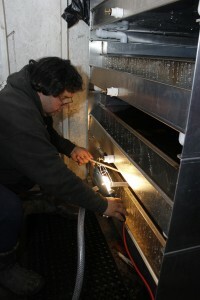 Little Boston Hatchery technician Jeff Fulton works with a tray of eggs in the new NOPAD incubator system. More photos can be found by clicking on this photo. The tribe is maxed out with the old system, McCollum said, so the NOPAD trays will help increase its chum production while using minimal additional water or floor space. “Most of our chum will go into our raceways, as we’ve always done, but now we’ll have more to put in the net pens, which, in the end, will result in bigger fish at release. For more information, contact Paul McCollum, Port Gamble S’Klallam Tribe natural resources director, at (360) 297-6237 or paulm@pgst.nsn.us; or Tiffany Royal, Northwest Indian Fisheries Commission public information officer, at (360) 297-6546 or troyal@nwifc.org.